“Christmas tree (check), presents (check), food (check)…” Anything missing?? Actually, No. 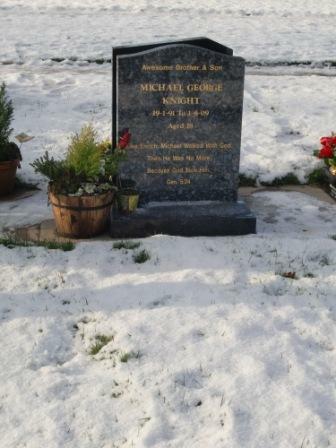 We went up to see Mike’s grave today and I have been wondering, “I wonder if they celebrate Christmas in Heaven”… I reckon they do actually. I miss Mike a lot, the whole family does… but, He is always going to be with us, and we WILL see him again. Everyone has been questioning how we will be this Christmas… we’ve had a number of phone calls already from friends and family saying they’re thinking of us… and yet again, we feel so blessed and humbled to have such wonderful friends. But, by God’s Grace, we’re enjoying the event! Yes ok, there are a number of presents missing from under the tree… but in all honesty, I don’t think we’re thinking about what is missing… I’m not. Mike isn’t missing. This entry was posted on December 24, 2009 by akilaknight. It was filed under Random Thoughts of a Growing Mind... .